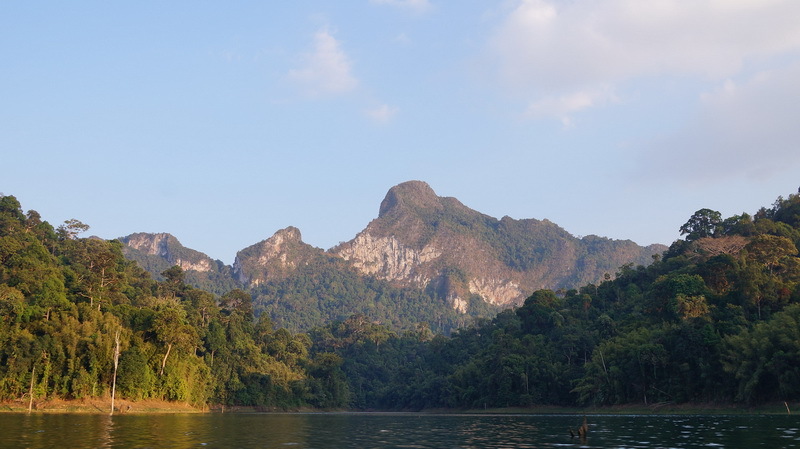 Overnight camping tours from Phuket to Cheo Lan Lake are probably the only tours which let you truly experience all the beauty of Southern Thailand. 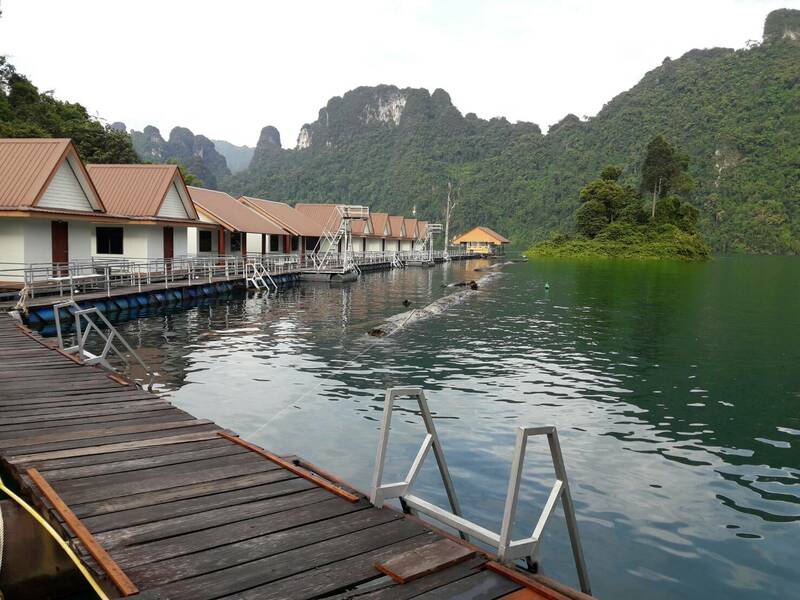 In this two-day, one-night camping tour, you will have an elephant ride in an unspoilt jungle, visit mysterious Monkey Temple and explore the gem that is Khao Sok National Park – the Cheow Lan Lake by Thai traditional longtail boat. Located remotely from big cities, Cheow Lan is an idyllic place to enjoy peace and nature. This tour is the perfect choice for nature lovers and those who love to explore. A TOUR GUIDE AT THE LAKE CAMP. *Additional transportation cost should be added to the tour cost per person. However, it is not applied for Infants. National Park fee 300 baht per person, to be paid at the pier, before entering Cheow Lan. PAYMENT: For this tour we require a pre-booking deposit in the amount of 1000 THB per person. After you completed and sent us booking information you will receive a confirmation email from us with an invoice to pay the deposit. Rest of the payment should be paid on the day of the tour. We require this deposit because for this tour we have to book bungalows in advance. – It is slightly colder at night than in Phuket. – Electricity is available only from 6:00 pm to 10:00 pm. 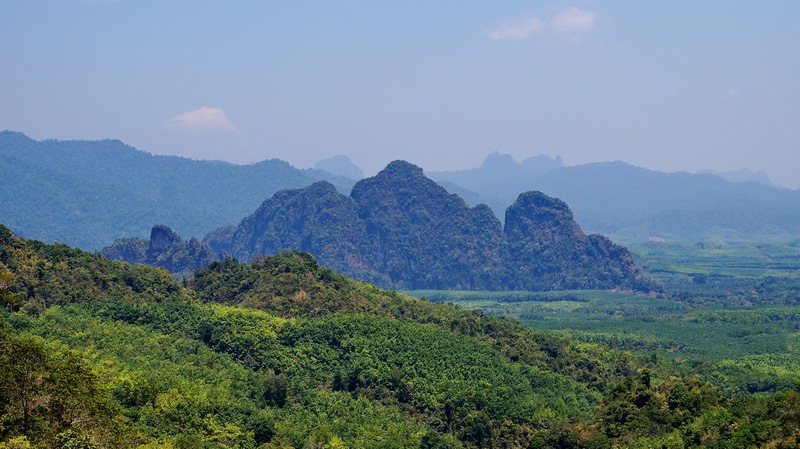 Your day will start with a scenic drive through Phang Nga Province. While on the way, you can observe the local lifestyle and scenic views. The first stop of the tour is on the mainland. From here you will cross the famous Sarasin Bridge, where you will see how a narrow sea channel cuts the island off from the mainland. The drive from your hotel to the first stop takes approximately one and a half hours. The first place you will visit is the mysterious Monkey Temple. A family or maybe several families of naughty Macaques live around a limestone rock formation and you will definitely see some of them. However, sometimes only a few monkeys come down from the rock so you may not see many. The temple itself is located inside a huge cave in the same karst rock. Mesmerising stalactites and various Buddha statues create an enigmatic atmosphere. Indeed, locals have many legends and beliefs about this area, which is similar to the landscape in the movie ‘Indiana Jones’. 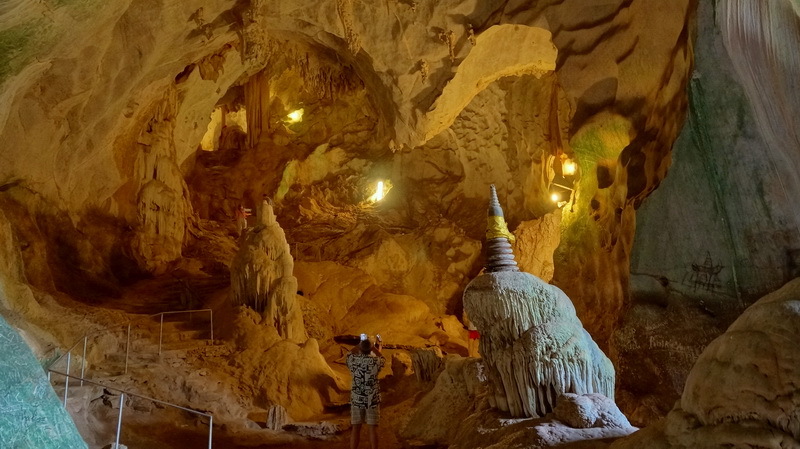 To enter the cave you will be asked to pay a 20 baht donation. Outside the cave there are stalls where you can buy bananas and nuts to feed the monkeys. Don’t forget to bring some cash with you. 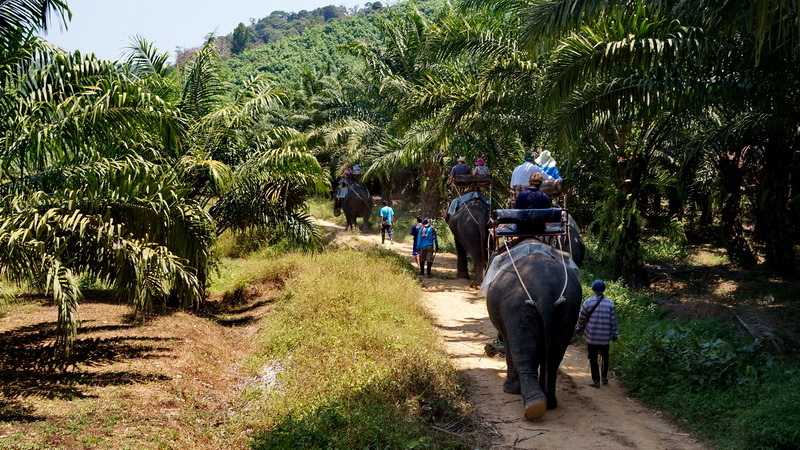 Once you arrived at the Elephant Safari Camp and exchange one mode of transportation for another as you mount a giant Asian elephant. 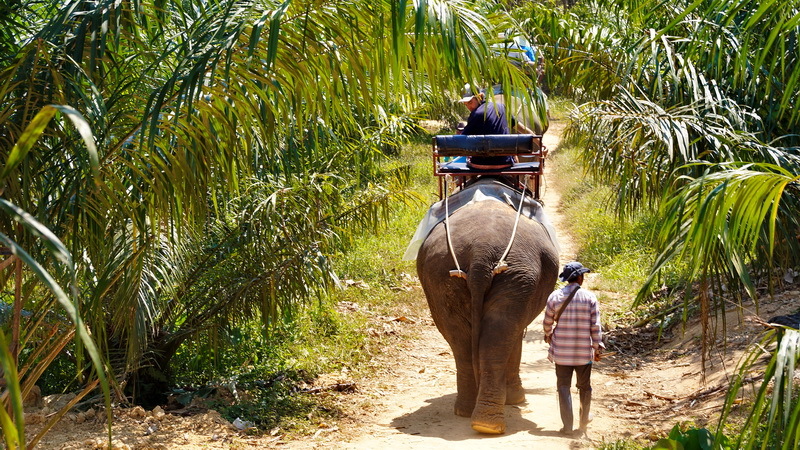 A mahout, elephant keeper, is right there with you as he guides the gentle animal through the tropical jungle. Before you arrive at Cheo Lan Lake there will be two more stops along the way, one for lunch and the other for taking photographs from the viewpoint of the National Park valley. 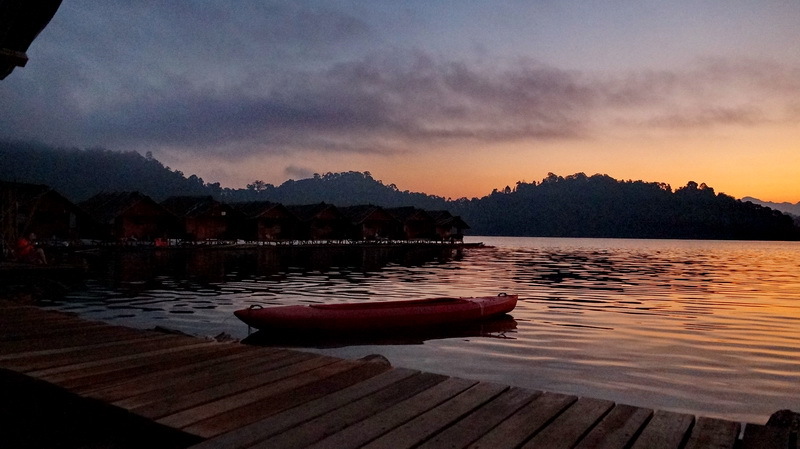 Your journey to the Cheow Lan Lake starts when you arrive at the pier. 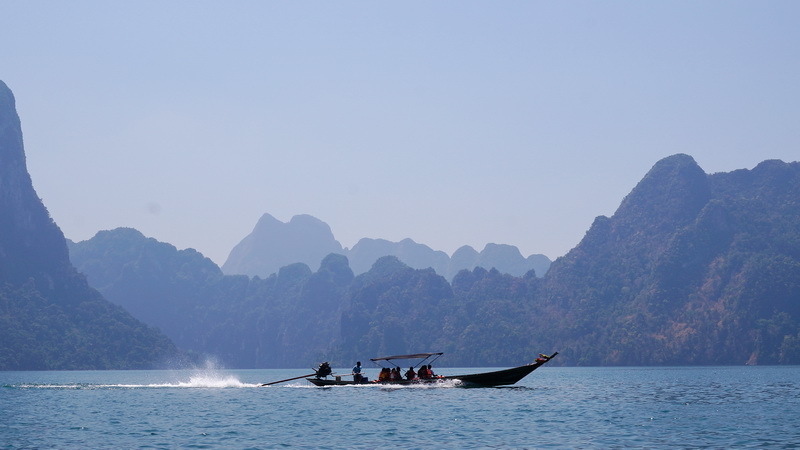 Here you change from your minibus and hop into a longtail boat. The scenery is breathtaking. 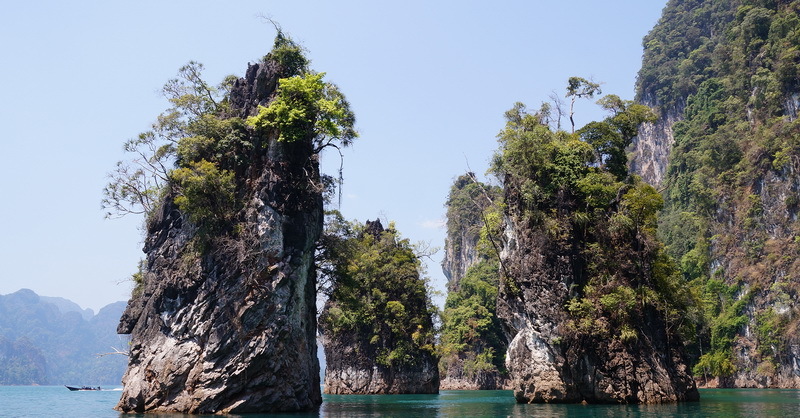 Towering above the water are limestone rocks which are covered with emerald jungles. Huge and small, they create an amazing and unique landscape inhabited by various animals such as monkeys, guar cows, and numerous varieties of birds. You will have a chance to spot some of them during a night safari by boat. The tour is perfect for lovers of wild animals, bird watchers and nature photographers. 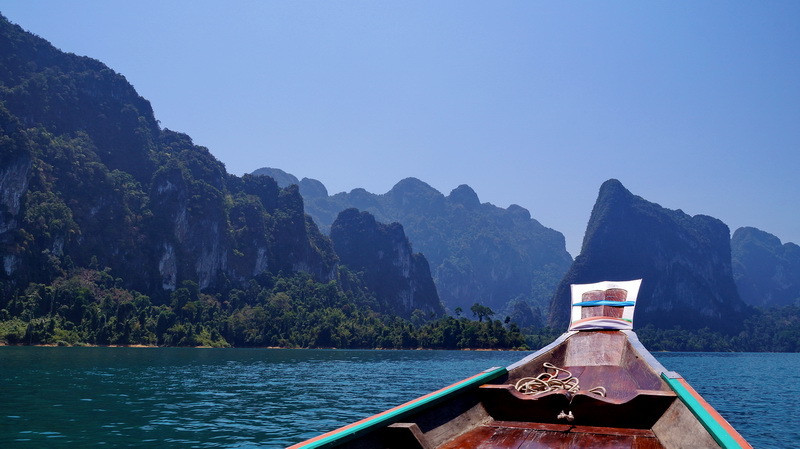 Cheow Lan Lake is one of the few places in Thailand free of roads, electricity, and mobile telephone masts. This says something, doesn’t it? There are plenty of natural caves and caverns in limestone rocks all around the lake. It is unlikely that anyone knows how many of them exist, while only a few have easy access and even fewer where tourists are allowed. Moving further into one of the caves, you will soon find yourself in total darkness, an underground world with no sunlight and no sound except those made by you or members of your group. It’s a good idea to bring a flashlight with you if you have one, but if you don’t, no worries, our tour guides always have one. While exploring the cave you will walk, crawl, climb and sometimes even swim. You will see how in stalactites and stalagmites, nature has created tangled patterns, and with each unique masterpiece you can let your imagination find different recognisable shapes and forms in them. INTERESTING FACT: The average growth rate for stalactites is 0.13 mm per year, which means that a stalactite the size of an average hand (170 mm) is 1300 years old! Breaking and taking stalactites with you is strongly prohibited! There are several floating villages on the lake, from simple bamboo huts to more expensive houses. On this tour we offer simple bamboo huts, the more simple the closer to nature. Simple bamboo huts are less expensive and do not require advanced bookings. When preparing for the tour please keep in mind that usually the power goes off after 10:00 pm (actual time may vary). So, don’t forget to bring a spare set of batteries for your camera or power banks for your other devices that you are going to use. The floating village has kayaks which you can take advantage of and use for free in your spare time. And for those who love fishing, you can rent a fishing rod at the camp. You will be pleased to find that the fishing here is pretty good. PICK UP TIME: Between 7.00 – 9:00 am. 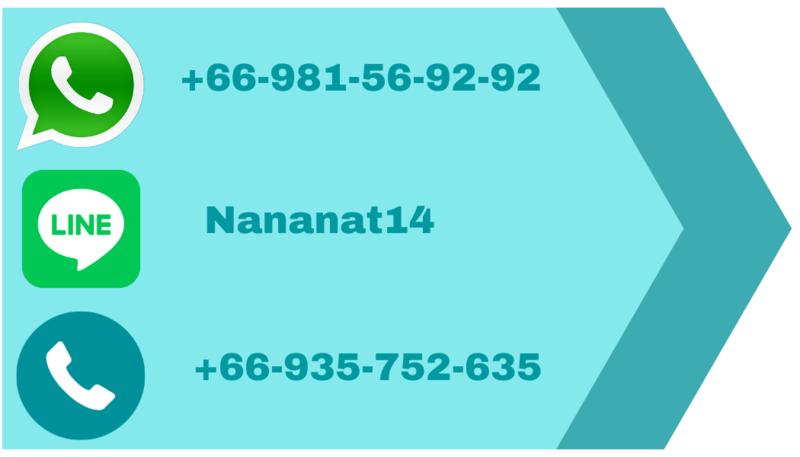 We will send you the exact time after booking is confirmed, the pick-up time depends on hotel location. PLEASE BOOK THIS TOUR AT LEAST 24 HOURS IN ADVANCE. ARRIVAL TO YOUR HOTEL: Approximately 5:30 pm – 6:30 pm on the second day of the tour. IMPORTANT: A sequence of the tour itinerary might be changed because of weather condition or other reasons. We will always visit all mentioned places, just sometimes in a different order. The day will likely be hot and sunny, so bring sunglasses, a hat and drinking water. And don’t forget your camera! You may bring a flash if you have it. It is slightly colder than to Phuket, be ready for it. For two days we recommend you to bring two sets of cloth, and swimming suit for swimming in the lake. PLEASE notice there is a transportation fee for this tour from Rawai, Nai Harn, Panwa beach + 200 baht per person. 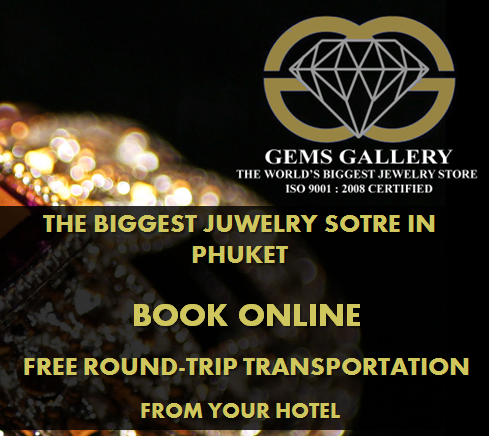 BUT Kata, Karon, Patong, BangTao, Maikhao, Naithon, Surin and Kamala Beach – NO Extra FEE. BOOK NOW AND PAY LATER. 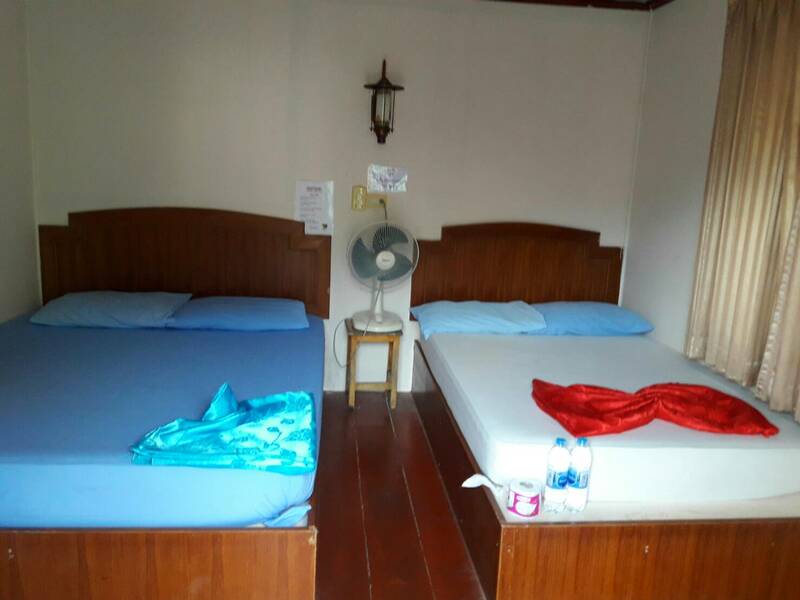 AFTER YOU COMPLETED YOUR RESERVATION YOU WILL RECIEVE INVOICE IN YOUR EMAIL BOX to PAY ONLY DEPOSIT AMOUNT 1000 BAHT PER PERSON. INVOICE CAN BE PAID USING A CREDIT CARD OR PayPal ACCOUNT. REST OF THE AMOUNT WILL BE PAID ON THE DAY OF THE TOUR. NATIONAL PARK FEE 300 BAHT PER PERSON, TO BE PAID AT THE PIER, BEFORE ENTERING CHEOW LAN. IF YOU WANT YOU CAN BUY BANANAS TO FEED MONKEYS OR ELEPHANTS.